We measure oil barrels and corn harvests. So why not justice? Access to justice is a basic right in democratic countries. But tracking its implementation and progress is tricky. The world measures every barrel of oil produced each year and every grain of corn it harvests, but not basic legal rights like the number of people denied access to counsel or abused in detention. This lack of a measurement is particularly problematic for the world’s poor in developing countries. When the poor are accused of a crime, they often face the justice system alone and may be subjected to years of detainment and human rights abuse while awaiting trial. In the Democratic Republic of the Congo, for example, three in four people in prison are in pre-trial detention. In India, the number is two in three people. Research by the Open Society Foundation and work in prisons by International Bridges to Justice shows that the vast majority of torture and abuse at the hands of the State takes place during this pre-trial detention phase. In the past decade, important strides have been made on this issue. But how can we really fix this problem, if we can’t track it? Today we can. This week marks the launch of the Access to Justice Index, a ranking of countries’ records on access to justice by the Global Initiative for Access to Justice (GIAJ), a nonprofit group based in India. The Index has been piloted in five BRICS countries (Brazil, Russia, India, China, and South Africa), which together account for three billion people. The development of the Index was supported by International Bridges to Justice (IBJ), an organization dedicated to ensuring basic legal rights of ordinary individuals worldwide. 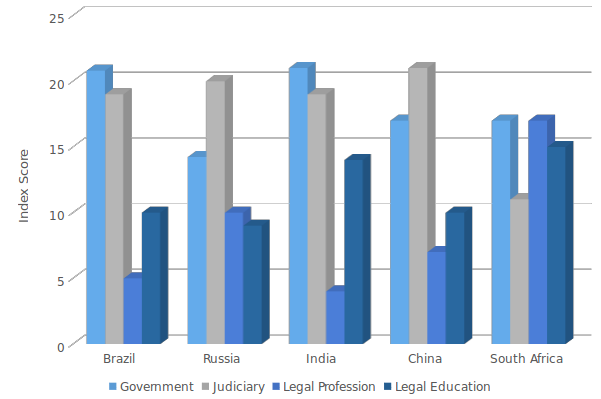 The Access to Justice Index will publicly measure how four critical root factors contribute to accessing justice: 1) the government 2) the judiciary 3) the legal profession, and 4) legal education. The index helps evaluate a nation’s effectiveness in providing access to legal resources for citizens, including the most vulnerable members of society. It also recognizes the transformative impact of technology in improving access to justice, as it incorporates technology as a factor to measure governments’ legal infrastructure. Access to justice is crucial because it has a ripple effect on a country’s prosperity, stability, and security. The index will support the UN’s Sustainable Development Goal 16, which calls for “providing access to justice for all” and building “accountable and inclusive institutions.” All UN member countries have committed that this goal should met by 2030. No country - developed or developing - is immune to abuses in the justice system. There has never been a better time to help people access justice. In a world riddled by conflict, religious strife, and huge flows of refugees, the need for increased justice has never been more urgent or more apparent.